This stall has an interesting name. "Ang Mo" is a local slang describing the Westerner, mainly in Singapore. It literally means "red-haired" and it originates from Hokkien. 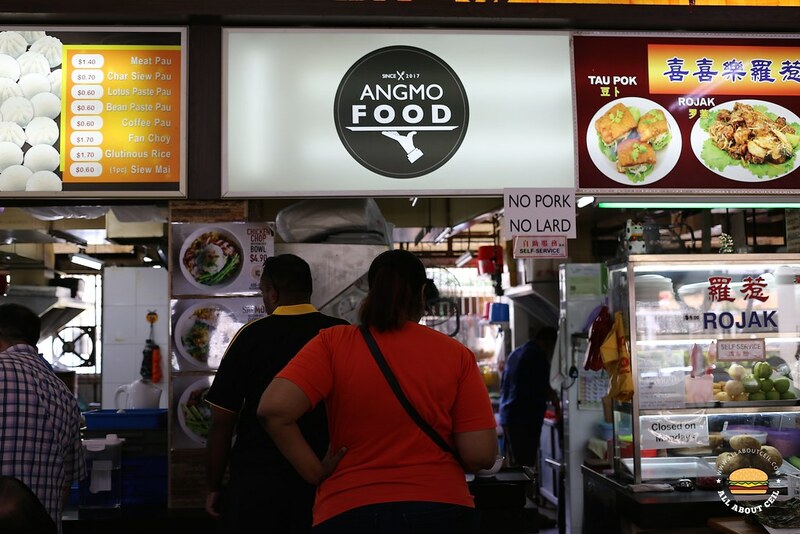 And so, "Ang Mo Food" actually means Western food which this stall is serving, including different types of rice bowls. 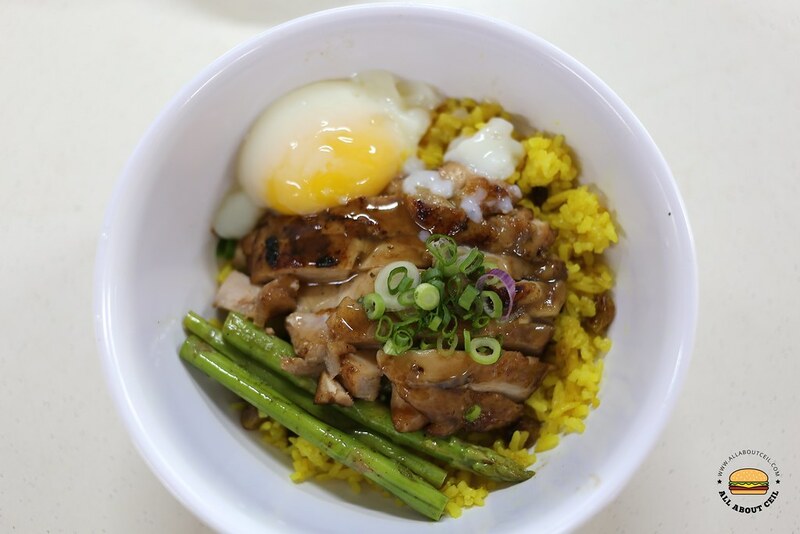 There are Chicken Chop Rice Bowl ($4.90), Salmon Rice Bowl ($6.90) and Beef Rice Bowl ($6.90) with the option to top up $1 for mushroom soup. I got to know about them from a post on Facebook and decided to try it since it is in my hood. I went with a friend on a Sunday for lunch. We were told that only rice bowls are available and they only start serving the usual Western fare from about 6 pm onward. We decided to go with Chicken Chop Rice Bowl as well as Beef Rice Bowl and topped up $1 for the mushroom soup. A number tag was given after the payment and was told that they will ring the bell and call it out when the order is ready for collection. We were seated at a table a little too far from the stall and could not really hear it too clearly, I decided to go check at the stall after waited for a while. Our order happened to be the next in line. 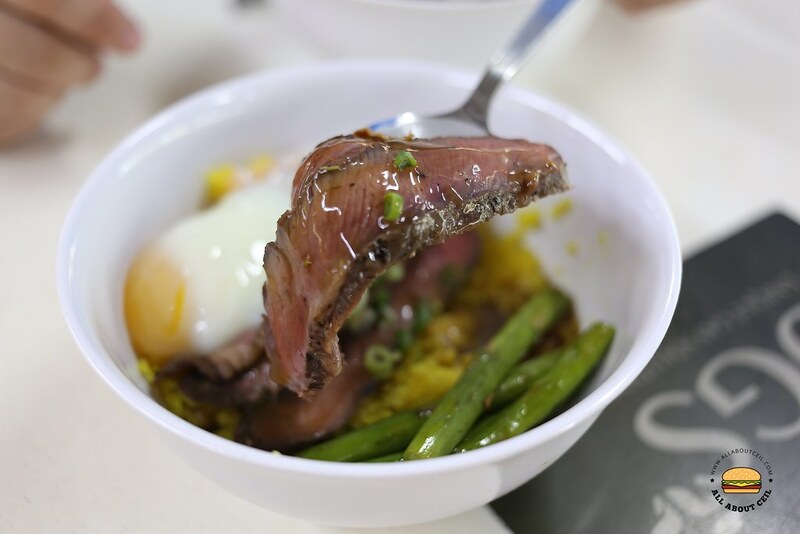 The chicken chop was cooked using the sous-vide method then pan-seared and served with raisin butter rice, asparagus, and an onsen egg with their house-made brown sauce. The chicken, though tender but was not too flavorful. I could not taste much of the butter flavor in the rice and the raisin did have much effect to enhance the flavor as well. The egg was also cooked using the sous-vide method but the yolk was not as runny as expected. We were supposed to break the yolk and mixed it with the rice. We did not like it. 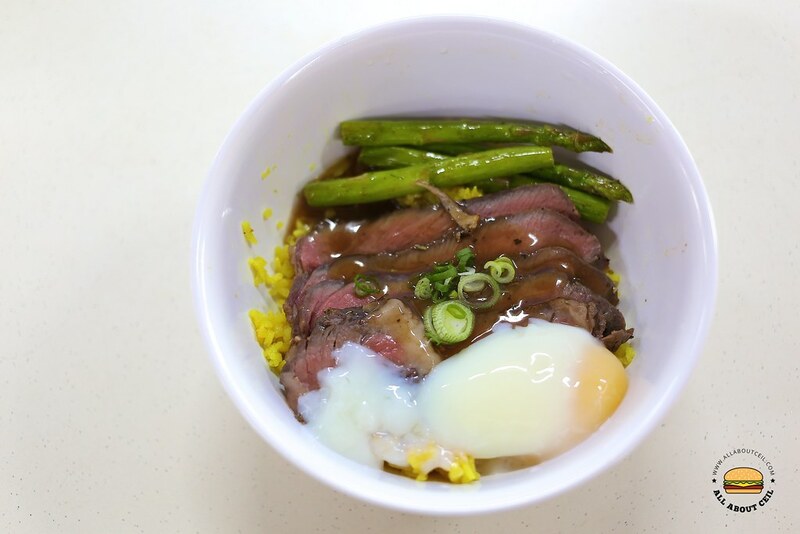 The Beef Rice Bowl consists of sliced beef cooked using the sous-vide method before pan-seared it to slightly charred the surface but still retained its moisture within. 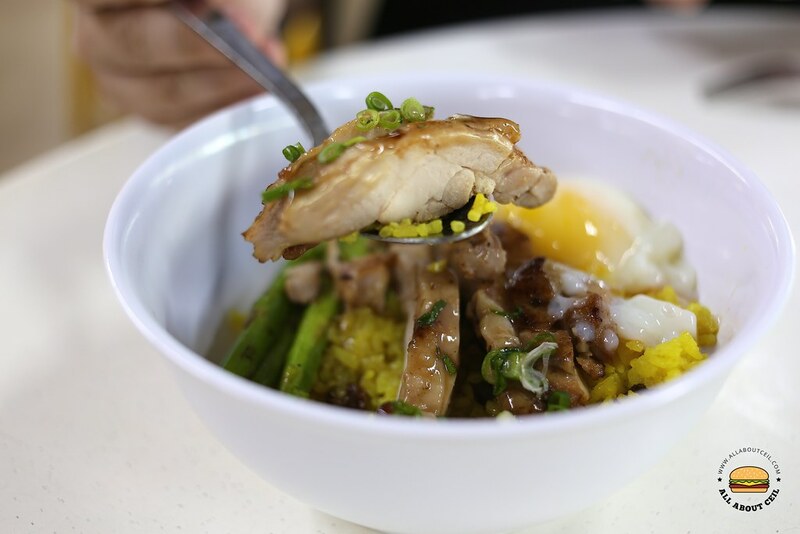 It is served atop of the raisin butter rice together with asparagus and an onsen egg with the same brown sauce that they served with their Chicken Chop Rice Bowl. 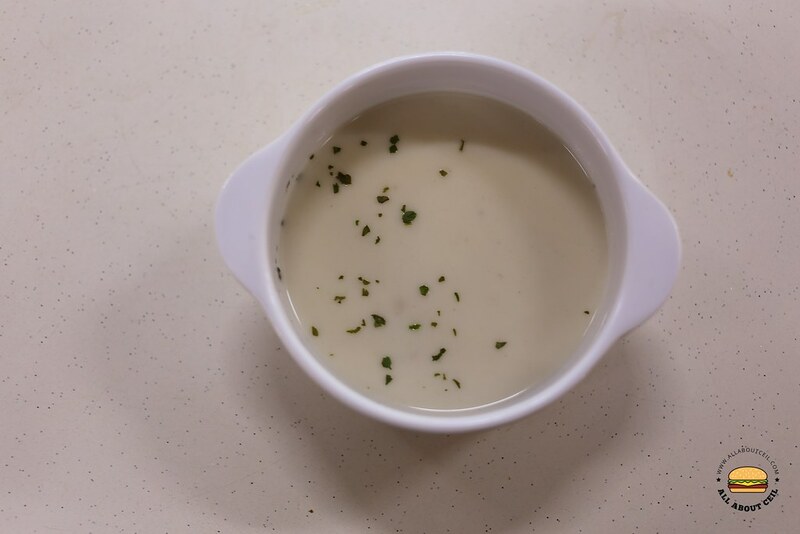 I would say forget about topping with $1 for their mushroom soup, it tasted like those the canned mushroom soup and it did not quite worth the value. I felt that their emphasis is on the cooking technique but not too much on the flavor where they should work on to improve it.